Sociology | Colorado Mesa Univ. Sociology is the study of social life, social organization, and social change. Sociologists study the causes and consequences of a wide range of human behaviors, interactions, groups, organizations, and institutions. Students at Colorado Mesa University can take courses in sociology on substantive topics like inequality, family, religion, social movements, health, race and ethnic relations, gender, sexuality, and more. Sociology has a tradition of developing explanations for how social order can be maintained as well as how and why social change happens. Few fields of study are as far-ranging and relevant to the everyday world that we live in. Colorado Mesa University offers a comprehensive program leading to a Bachelor of Arts in Sociology. It is also possible to earn a Minor in Sociology, a degree which meshes well with virtually any other academic programs, including any of the other degree programs in the Social and Behavioral Sciences. Both options (BA in Sociology, Minor in Sociology) exemplify Colorado Mesa University's liberal arts mission by emphasizing critical thinking, statistical literacy, and the application of the "sociological imagination" to problems, programs, and policies in the real world. Beyond these opportunities, a degree in sociology prepares students for responsible action in the social world and provides a foundation for lifelong learning and civic participation. Sociology provides many distinctive perspectives on the social world, as well as a range of research methodologies that can be applied to virtually any aspect of social life, from corporate downsizing to problems of peace and war to the expression of emotion and beyond. Because sociology addresses the most challenging issues of our time, it is an expanding field whose potential is increasingly tapped by those who craft policies and create social programs. Sociology majors gain important skills in critical thinking, research methods and responsible citizenship. Thus they are well-prepared for future graduate work in Sociology and related disciplines, as well as for careers in social services, human resources, government, business, the health professions, and the criminal justice system. 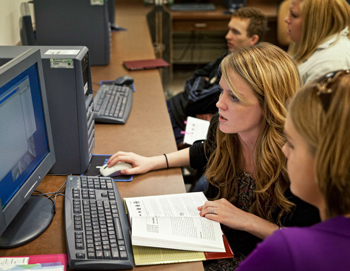 One of the strengths of the CMU sociology program is its emphasis on the values and content of a traditional liberal arts degree, providing students with critical thinking skills, communication skills, and research skills that are applicable in a broad range of careers in non-profit organizations, business and government. The program also offers excellent preparation for graduate study in sociology. Courses on substantive topics include social inequality, family, gender, sexuality, religion, race and ethnic relations, health, social movements, and environmental sociology. Sociology majors are encouraged to earn a minor in one of a wide variety of disciplines. Sociology majors at CMU enjoy a high acceptance rate to graduate school in sociology, applied sociology, and social work. Graduates who continue their education also go to law school, divinity school, public administration, human relations, and international studies. Click here for a more in-depth program overview. Sociology courses at CMU are taught by passionate and approachable faculty with doctorates from highly-ranked universities who have chosen to make undergraduate teaching their top priority. The small size of the program and faculty facilitate meaningful and repeated interactions between students and their professors. Furthermore, upper-division students enjoy small classes that offer ample opportunities for discussion and participation. Faculty also supervise students seeking research experience, undertaking independent study, and writing honor theses. In the past, students and faculty have even collaborated on research projects. Alpha Kappa Delta, the international honor society for sociology, provides funds and opportunities for sociology majors to travel to professional conferences and bring speakers to campus. Involvement in AKD is also a great "resume builder" that helps students applying for jobs and graduate school.